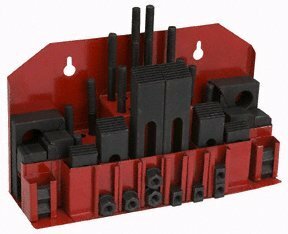 Save valuable set-up time with this step block and clamp set! Made of forged and hardened steel for optimum durability, this clamping kit can be utilized with milling machines and other metal/woodworking machines. The clamping set includes 3/8" studs, T-nuts, coupling nuts, ½" step clamps and step blocks to help lock and secure your project as you work. The clamping set comes organized in a solid steel holder.